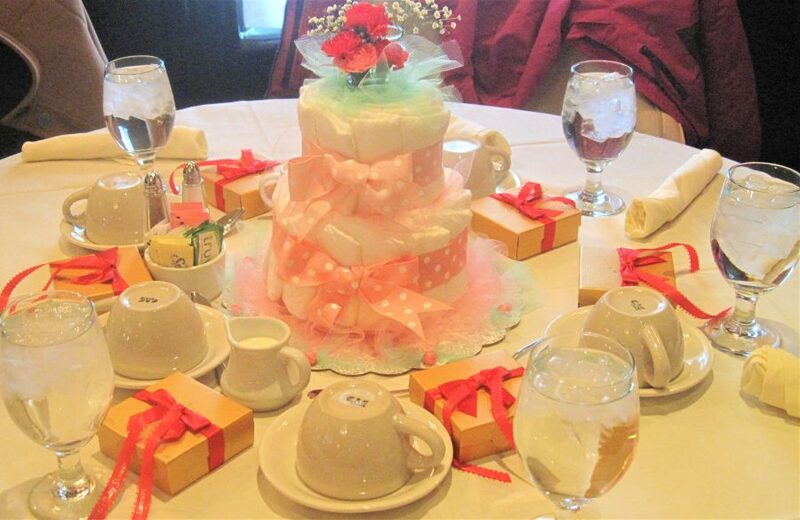 We decided to have diaper cakes as the centerpieces for the party, so I made one for each table and will share close up pictures of each layer. 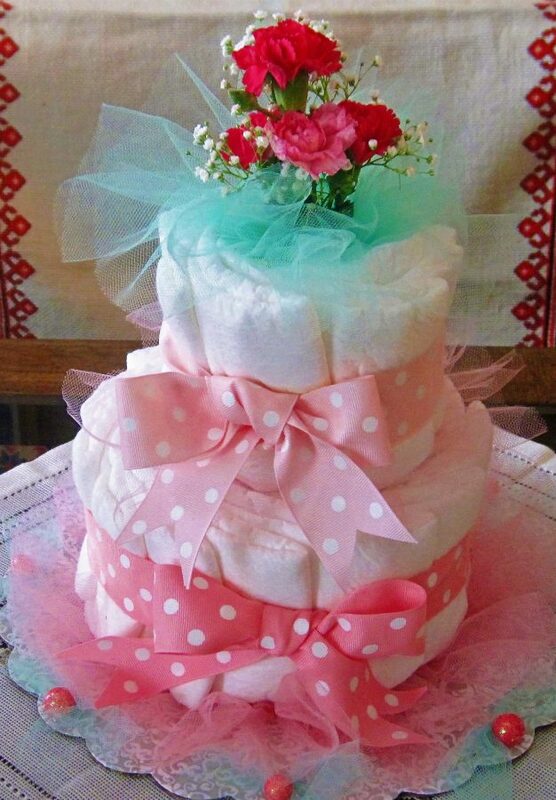 I used a disposable cake platter for the base, then attached a bud vase to it, as the center support; arranged diapers around it, to form the first layer. 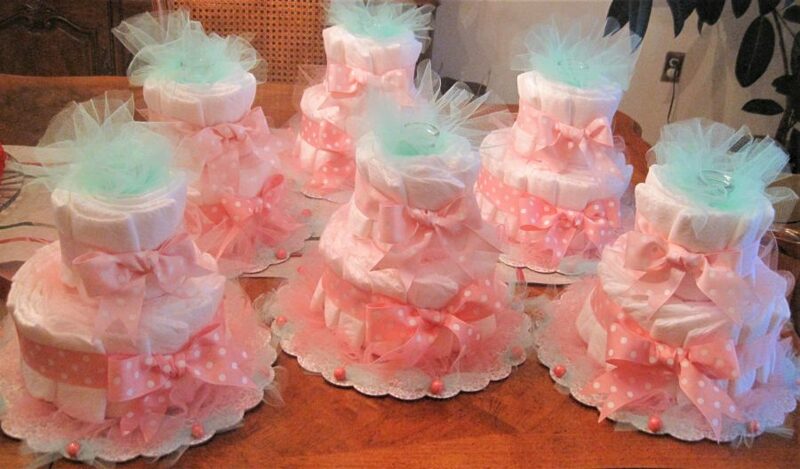 Fastened the diapers with a rubber band and ribbon, then added ruffled pink and teal tulle around the bottom. For a final touch, I attached decorative beads around the edge of the platter. 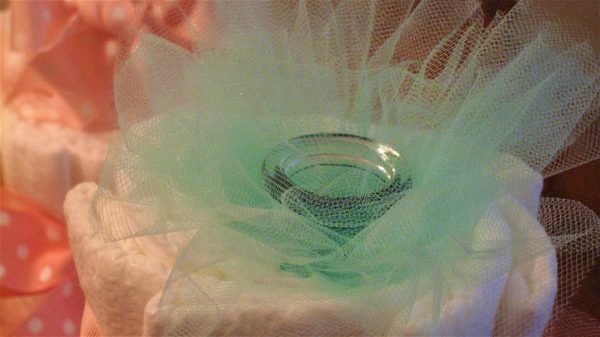 This is the top layer, where the top of the bud vase extends over the second layer of the diaper cake, and a teal tulle was used to cover the exposed vase edge, then a dainty bouquet of carnations and baby breaths were used as a topper. The vase came in handy for this project to serve as the center support and a water vessel for the flowers. Here you have the finished product. 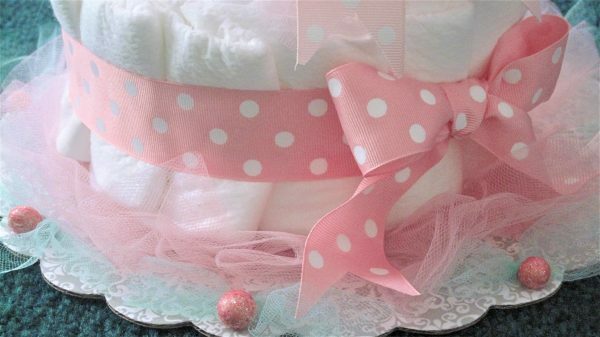 We were awaiting the birth of a baby granddaughter, hence the pastel colors of the ribbons and tulle. 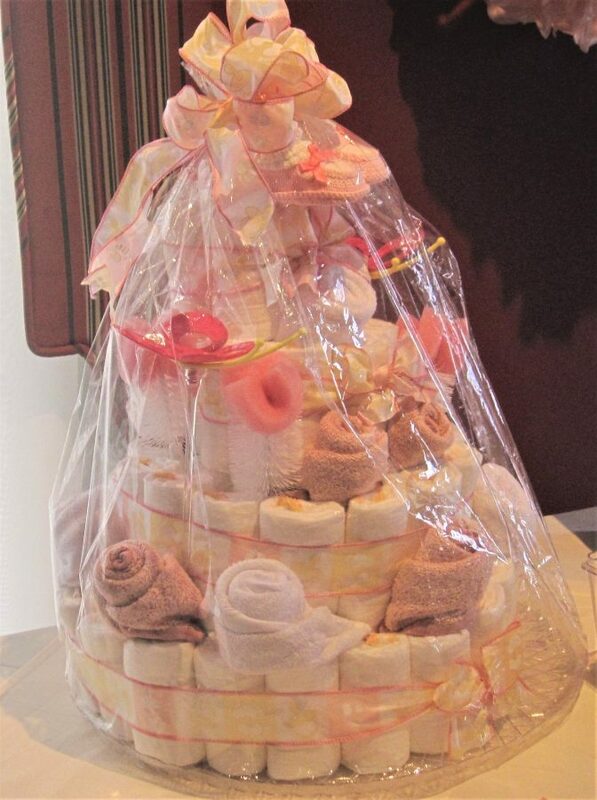 This is how this diaper cake presented itself as an actual centerpiece. 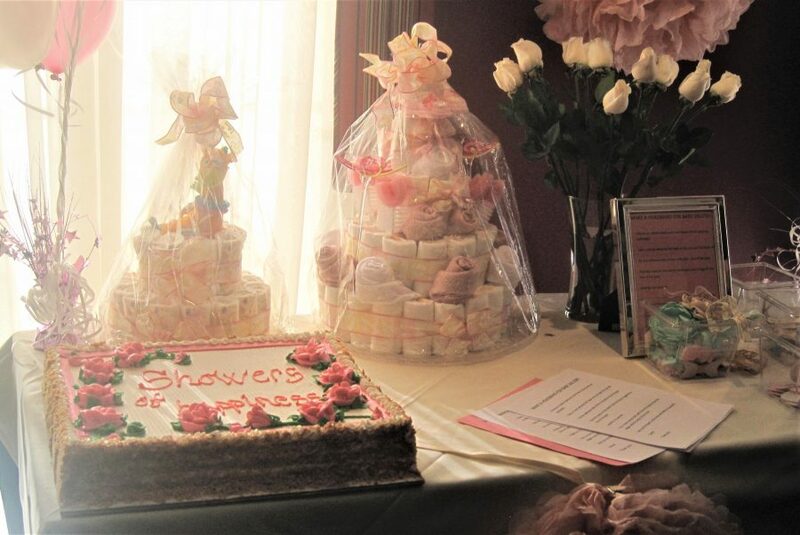 My daughter-in-law’s mom created these two diaper cakes. 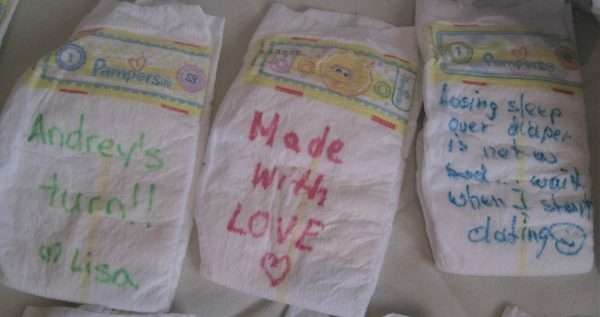 She used a different technique than mine, by rolling up each diaper then arranging them around the center base. 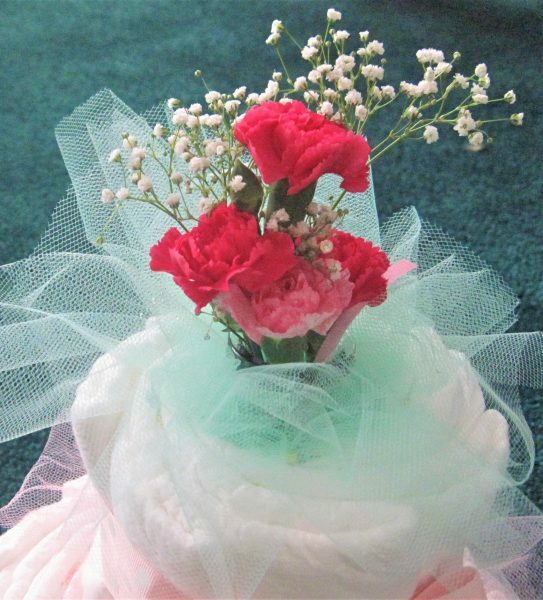 The first diaper cake is decorated with roses made out of baby wash clothes, and other small baby items, and topped off with booties crocheted by the great – grandma. 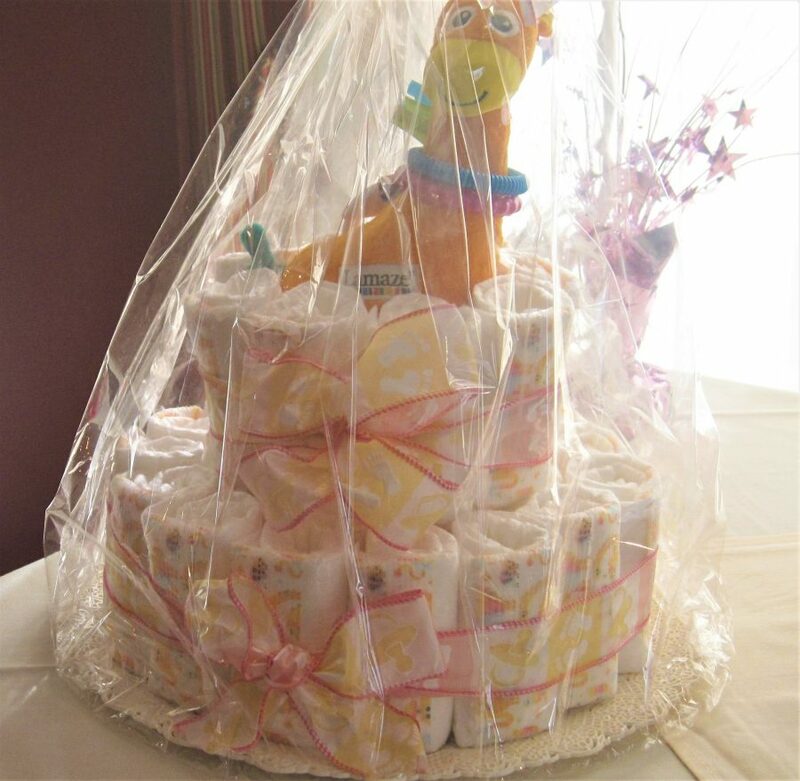 The second diaper cake matches the first one in construction and ribbons, but has a baby giraffe as the topper. 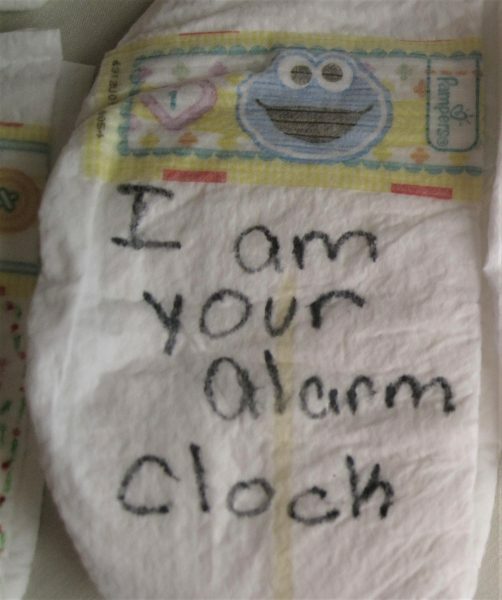 This was specifically selected to match the decor of the baby’s room. 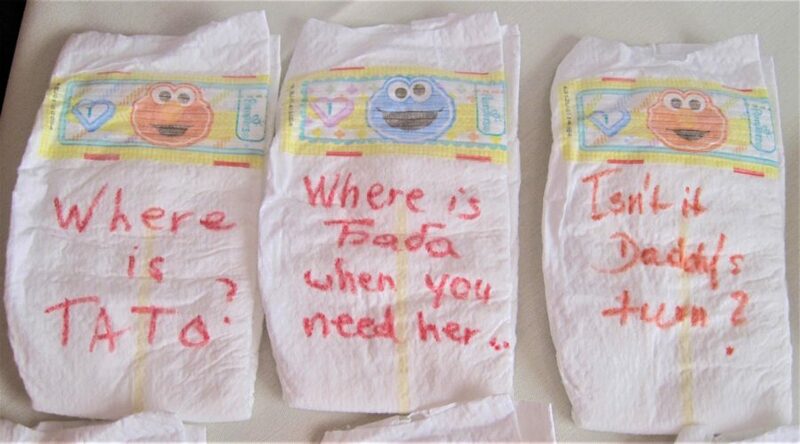 Since many of us in this family love crafts, we incorporated this activity into the baby shower. 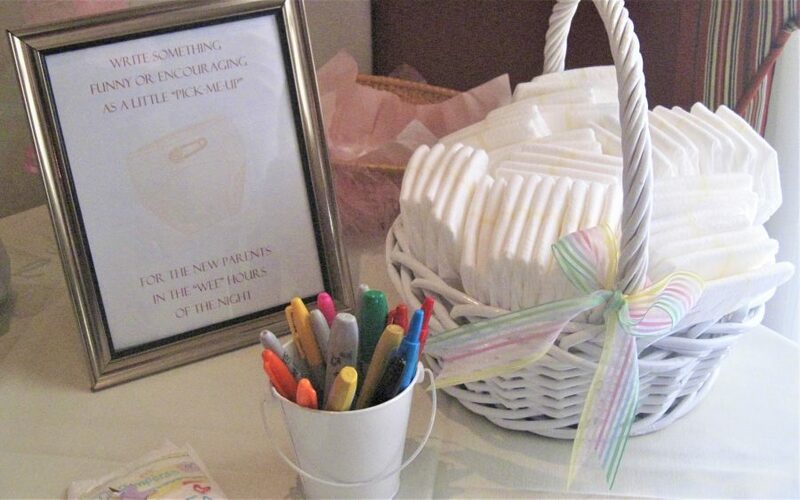 Here is a display of tools and supplies to create your own baby headband for the new arrival. The picture I took of the finished product did not come out to my satisfaction, so unfortunately I was not able to share it with you. 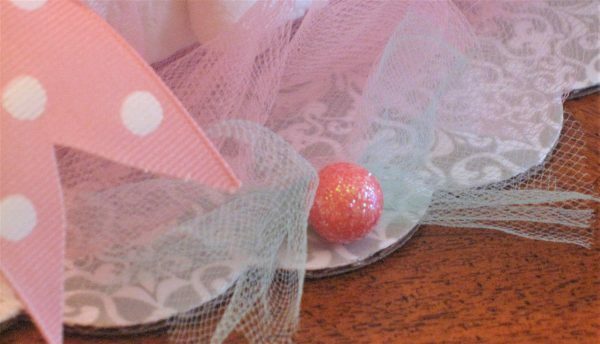 All the supplies were used up, hence a lot of cute headbands were created for the little one. 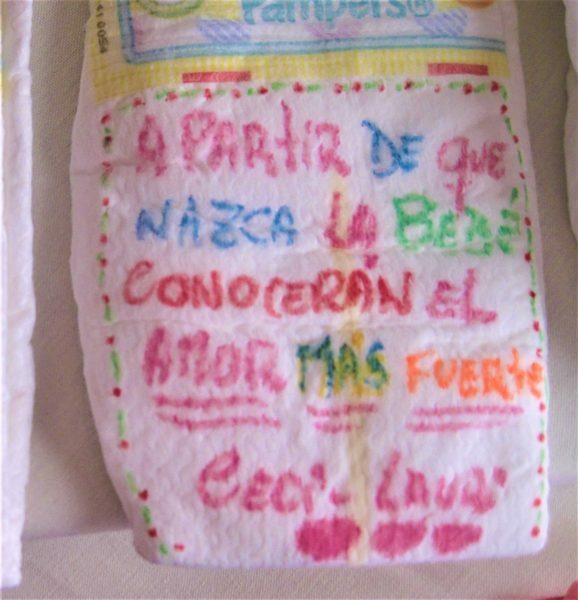 This is another fun craft station, where diapers were decorated with inspirational messages for the new parents, to brighten up their mood at diaper change time….especially the ones during the middle of the night when you can’t even keep your eyes open, yet you still have to change the baby, feed it, and lull it back to sleep. 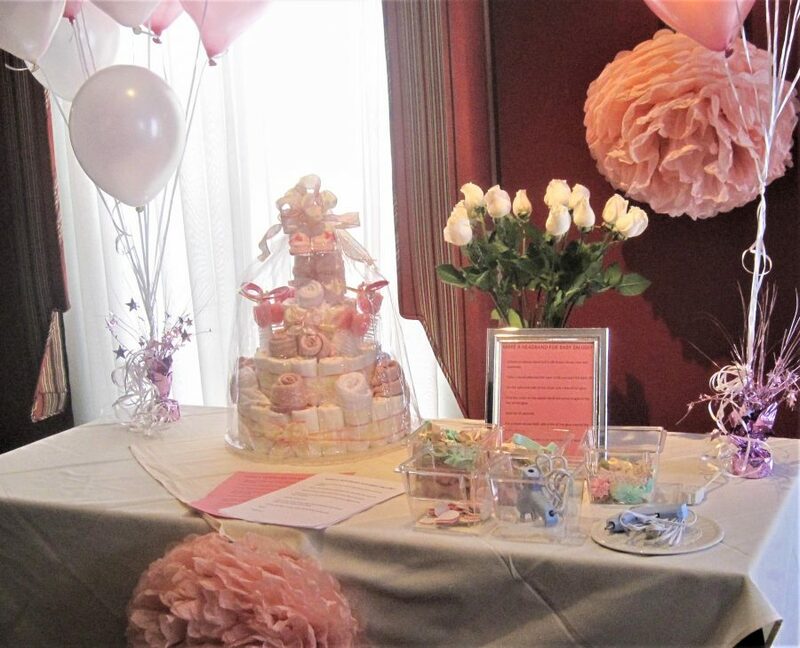 I had to finish on a sweet note….displaying the beautiful and delicious cake we all enjoyed at the end of the party.